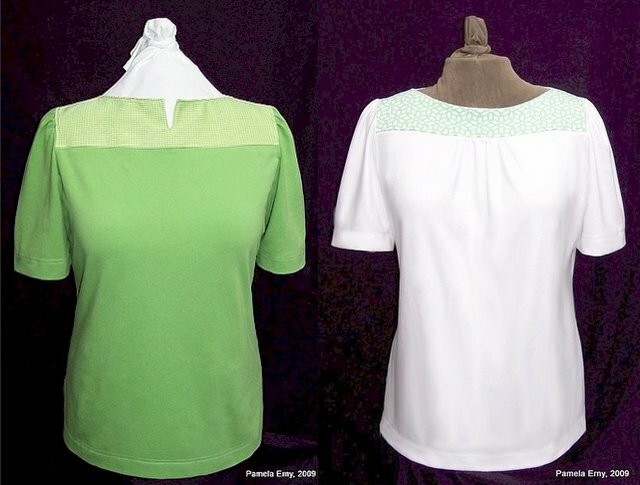 Brensan Patterns and the "Barcelona Blouse"
I love the color green. So much so that I have to watch that everything in my wardrobe isn't in some lovely shade of that color. But I hadn't yet made anything green this season. So I traced off the HotPatterns Riviera Annisette Top, and made two...one very green, the other with just a touch of green print on the yoke. with a nice neckline, and subtle shaping of the side seams. The top on the left features a yoke made of silk dupionni with the body of the top in cotton/lycra jersey knit. I raised the neckline of this version, and added a CF slit. I wish I could say it was an intended "brilliant" design detail, LOL, but I can't. Because after raising the neckline and making the yoke from a woven fabric (when it was designed for knits) I needed to add a slit to get it over my head ! But I like the way it turned out...something a little different. SEWING NOTES: Yokes interfaced with PRO-SHEER ELEGANCE Fusible Interfacing from ~Fashion Sewing Supply~, Shoulder Seams pressed towards the body, so that the sleeve gathers would lay flat (rather than "puff up"). very pretty tops, Pam, it is so nice to see how creative you can be in adult clothing. Nice - very light and summery. Great additions to the green collection. I have to be careful with reds . . . I love the design changes. They both look great and I'm sure they must be very comfortable. Both of these are soooo cute and look like they will be welcome additions to your wardrobe. Cute tops! Great for the summer. I keep seeing great tops I have the patterns for and this is one of them. I need to make it! This is a good top for leftover pieces of knits I just couldn't bear to throw out. Love, love, love those tops! Hot Patterns has some nice designs. I like the gathers on the white top. Very nice. Oooooh........ So pretty! Lovely tops! I am a "greeny" too. I would have everything green if I could.